There has been much debate among historian about the extent ot which the Scottish Enlightenment was a consequence of the Union with England in 1707. 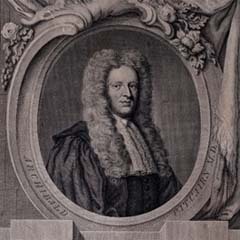 The existence of figures such as Archibald Pitcairne (1652–1713) provides powerful ammunition fo those who trace the roots of the Scottish Enlightenment back to before the Union. 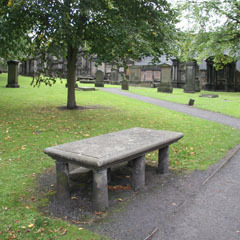 Pitcairne was an noted Edinburgh physician and scholar. He had been professor of medicine at the University of Leiden in the Netherlands, but returned to Edinburgh in 1693. He was also an important early disciple of Isaac Newton, one of a group of Edinburgh Newtonians who played a significant role in the spread of Newton’s theories. His satirical writings criticising the Church earned him a reputation as an atheist and freethinker. Other inportant Edinburgh virtuosi, as they are sometimes called, included Sir Robert Sibbald (1641–1722) and Andrew Balfour (1630–94). Portrait of Archibald Pitcairne (1652-1713) by Robert Strange. 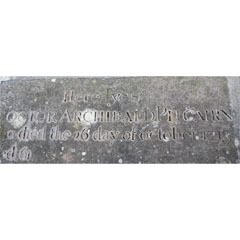 Inscription on the grave of Archibald Pitcairne.